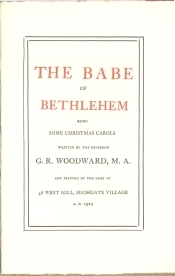 Written by the Reverend George R. Woodward, M.A. As in Carols for Yule-tide, the peculiar measures, rhythms, & rimes of some of these Carols are to be accounted for by the Editor’s continued & honest endeavour to preserve the integrity of the ancient melodies to which alone, respectively, they should be sung. Where not original, the words are either close translations, or else free adaptations of older material, Greek, Latin, &c.
Again, in the process of imposing & printing of the Carols, the Author has been aided by his friend, Mr. A. Oliver. The Edition consists of but 2OO Copies, whereof this impression is number 100. This is a text-only collection; Rev. Woodward did not provide any music.